Who says you can't have dessert on a diet? 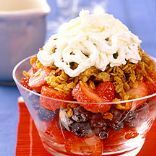 This is an excellent way to enjoy a low-fat, low-calorie dessert. Easy, cheap and so much better for you! This simple, rich recipe has only two ingredients! 1 Point. Indulge your sweet tooth by biting into crisp mini chocolate cookies packed with melted pockets of chocolate chips. This low-fat version of banana bread gets dressed up with peanut butter and chocolate chips. Low-fat buttermilk is the secret ingredient! Enjoy yummy carrot cake without the guilt. All the flavor with none of the guilt! Top off your favorite cakes or brownies with this delicious low-fat, low-sugar frosting. Baked into mini muffins, these sweet and nutty blondies are perfectly portioned. Brown butter adds a layer of richness. When I want chocolate mousse, only the real deal will do. This version is low in fat, but it's still creamy and rich. The hardest part is waiting for it to cool!